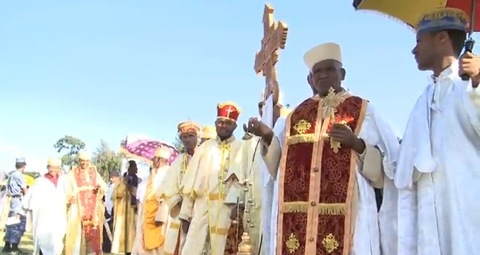 Millions of Ethiopian Orthodox church members on Wednesday celebrated the Demera, the eve of the discovery of the cross on which Jesus Christ is believed to have been crucified. Celebrations began in the afternoon with tens of thousands of followers gathering at Meskel Square to celebrate the holy day, together with hundreds of pilgrims, tourists and foreign diplomats. In Addis Ababa, all roads leading to the city’s famous Meskel Square were closed for the day to avoid traffic jams. Demera, the eve of the discovery of the cross, one of the main religious ceremonies of Ethiopia’s most dominant religion, is celebrated colorfully throughout the country. More than 100,000 people, including hundreds of priests and deacons attired in Ethiopia’s traditional plain white clothes, gathered to mark the day with a grand bonfire ceremony, lit by the leader of the Orthodox Church. Demera, also known as Meskel Festival, is also celebrated in remembrance of Empress Helena, who according to tradition was led to the cross after smoke from incense she was burning during her prayers drifted towards the direction of three buried crosses, one of which was the True Cross on which Jesus Christ was crucified. She gave pieces of the True Cross to all churches, including the Ethiopian Church, with parts of it said to be in Israel. The ancient festival, dating back 1,600 years, is celebrated with yellow Meskel daisies placed on top of huge bonfires as priests, carrying silver Coptic crosses and flaming torches, dance with their followers around the fires singing and chanting. This year, however, marked the first time in 21 years when the celebration was observed in the absence of the late Patriarch of the Ethiopian Orthodox Church, Abune Paulos who died in August. The celebration also marks the end of Ethiopia’s three month long rainy season. The Horn of Africa country uses its own calendar, which has 13 months, or Pagume. Like a leap year, Pagume has either 5 or 6 days depending on the season. According to Ethiopian tradition, the Meskel cross was reburied on the mountain of Gishen Mariam monastery in Wollo region after a powerful light emanating from it stripped naked anyone who approached. The monastery of Gishen Mariam, one of the country’s main tourist attractions, has records of the story of the True Cross of Christ and how it was acquired. The Ethiopian Orthodox Church has more than 50,000 churches and 1,200 monasteries with about 50,000 monks and nuns for an estimated 40 million plus orthodox Christians, about half of the country’s total population. Ethiopia is lobbying that the Meskel Festival be granted UNESCO World Heritage status. Few spots in the world are more beautiful than tropical islands, and Caribbean wedding vendors are well aware that their magical locales are perfect for memorable weddings. When you’re planning the perfect wedding, it’s wise to consider the Caribbean. Wedding vendors know that the idyllic combination of warm blue waters, sparkling white beaches, and endless days of sunny weather make for a wedding experience that is unforgettable. The happy couple as well as their lucky guests are sure to enjoy all that this paradise has to offer. The Caribbean is a collection of islands tucked off the eastern side of both North and South America. Resorts, hotels, vacation rentals and private villas are all available for your wedding and with the bounty of the sea at hand as well as the nearby large cities on the mainlands it’s easy to have fresh, delicious food and flowers for your event no matter which island you choose. Caribbean wedding services don’t stop at food and flowers though. There are so many different ways that these skilled professionals can make your day special, from helicoptering your guests in to remote islands for a private wedding on the beach to providing accommodations for all your guests with ocean views. Be sure to check out the wedding options that abound here in the Caribbean. 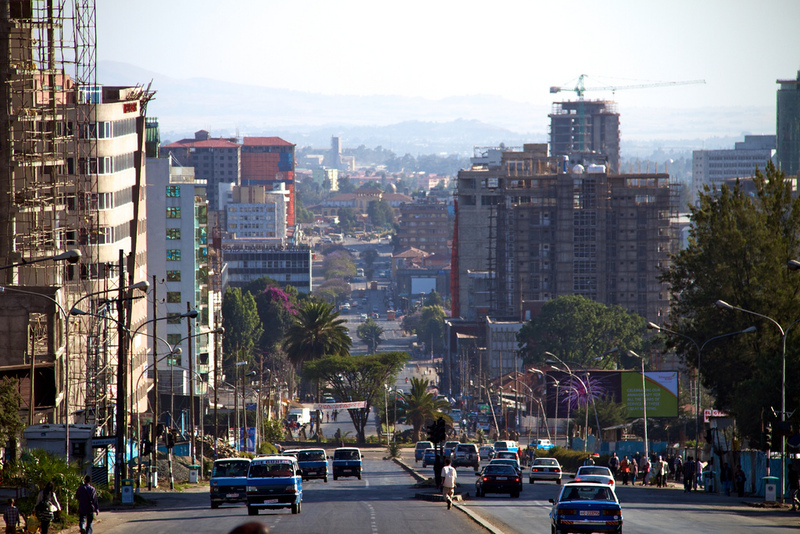 The name of this sprawling capital city means “New Flower.” Founded by Emperor Menelik in 1887 and with a population of about 4 million, Addis Ababa is Africa’s diplomatic capital with the headquarters for the Organization of African Unity located here. Impressive monuments of colonial architecture are scattered among stretches of sun-bleached shacks. Drive through “Mercato” the largest open market on the continent. Make interesting stops that include the National Museum, the Ethnological Museum and the Ba’ata Church known as Menelik Mausoleum. Enjoy souvenir shopping and visits to special art galleries. Yama Ethiopia Tours patronizes local charities providing guests with opportunities to make purchases that support them. Hotel accommodations range from tourist class to luxury collections and a variety of restaurants serve delectable dishes from around the world including, of course, Ethiopia. The national museum also contains some wonderful artifacts dating to the south Arabian period of the so-called pre-Axumite civilization of Tigrai. These include a number of large stone statues of seated female figures, thought to have been fertility symbols of a pre-Judaic religion. It is interesting that the figures have plaited hair identical to the style worn by modern Ethiopians (it has been suggested that the mythological Medusa of Ancient Greece was simply a dreadlocked Ethiopian woman). One almost perfectly preserved statue, thought to be about 2,600 years old and unearthed at a site near Yeha, is seated in a 2m-high stone cask adorned with engravings of ibex. Many of the other statues are headless-probably decapitated by early Christians, who converted many pagan temples to churches. Other items include a sphinx from Yeha, once again emphasizing Axumite links with the classical world, a huge range of artifacts from Axum itself, and a cast of one of the Gragn stones from Tiya. Continuing straight uphill from Siddist Kilo for perhaps 500m, a left turn through a tall gateway leads into the main campus of the University of Addis Ababa and the excellent Museum and Library of the Institute of Ethiopian Studies. Very different to the National Museum, but no less absorbing, this is an exemplary ethnographic museum, housed on the upper floors of a former palace of Haile Selassie, within the green university grounds immediately north of Siddist Kilo. The first floor of the building is dedicated to a wide array of artifacts and daily objects relating to most ethnic groups in Ethiopia, not only the monotheistic highlanders, but also the fascinating animist cultural groups of South Omo and Afar people of the eastern desserts. On the second floor is a new exhibition on Ethiopian musical instruments and visual art through the ages, an impressive selection of Ethiopian crosses, and a unique collection of icons dating back to the middle Ages. Outside the museum building, look out for the displaced ‘head’ of the largest of the Tiya stele in the gardens. On the ground floor of the building, the IES Library maintains one of the world’s most comprehensive collections of books and photocopied articles about Ethiopia; despite the archaic and occasionally frustrating card indexing system, it is an invaluable resource for anybody undertaking research on any aspect of Ethiopian culture and history. Mercato is the real commercial hub of Addis, a vast grid of roads lined with stalls, kiosks and small shops, where you can buy just about anything you might want, such as: the latest local cassettes; traditional crosses, clothes and other curios; vegetables, spices and pulses; and custom-made silver and gold jewelry. Prices are generally negotiable. You are currently browsing the TOURIST LIFE TRAVEL & TOUR blog archives for September, 2012.